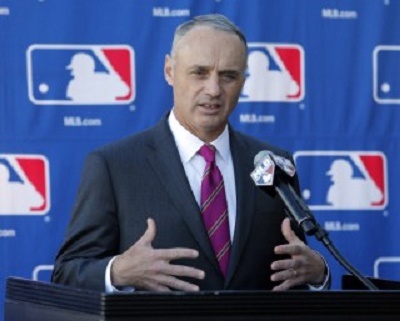 MLB Announces Domestic Violence, Sexual Assault And Child Abuse Policy | NOT IN MY WORLD!!!! In a year when violent and criminal off-the-field behavior by athletes has appeared prominently in the news, Major League Baseball has, for the first time, announced a comprehensive policy regarding players involved in domestic violence, sexual assault and child abuse cases. The policy was announced jointly with and in agreement with the players union. The terms of the policy, in their entirety, follow. In short, however, the policy has a dual treatment and intervention program along with a disciplinary program. The treatment and intervention part will include the creation of a Joint Policy Board which will be responsible for evaluating a player and supervising the treatment of a player if treatment is deemed appropriate. If the player does not adhere to a treatment program, he will be subject to discipline. Discipline will not carry a minimum or maximum penalty, but rather the Commissioner can issue the discipline “he believes is appropriate in light of the severity of the conduct.” Discipline will not be contingent on whether the player pleads guilty or is found guilty of a crime. A player can appeal discipline to an arbitration panel. A team cannot discipline a player unless the Commissioner delegates that power to the team. One small but potentially important part of this is that past discipline, or the lack thereof, for domestic violence cannot be used as a basis of appeal. Likely because there has been no past discipline in any real sense. As such, if Rob Manfred were to hand down a 100 game suspension or something for a first offense under this policy, the basis of the appeal can’t be “well, Milton Bradley didn’t get 100 games.” That should allow Manfred to set a strict discipline regime from the get-go now without worrying about being overturned. The parties have established a Joint Policy Board, comprised of three experts in the field of domestic violence, sexual assault and/or child abuse, and two representatives each from the Players Association and the Commissioner’s Office. The Joint Policy Board is responsible for evaluating, and where appropriate, supervising the treatment of a player. An expert member of the Joint Policy Board will submit his or her proposed Treatment Plan to the full Board for approval. The expert who prescribed the Treatment Plan will be responsible for overseeing the player’s compliance with the Plan. A player’s Treatment Plan may require him to submit to psychological evaluations, attend counseling sessions, comply with court orders (including child support orders), relocate from a home shared with his partner, limit his interactions with his partner, relinquish all weapons, and other reasonable directives designed to promote the safety of the player’s partner, children, or victims. The Joint Policy Board will refer persons affected by domestic violence to appropriate intervention services. A player who fails to comply with a Treatment Plan may be subject to discipline by the Commissioner. All information relating to a player’s involvement with the Joint Policy Board shall be kept confidential. The Commissioner’s Office will investigate all allegations of domestic violence, sexual assault, and child abuse in the Baseball community. Consistent with the parties’ collective bargaining agreement, the player and the Players Association shall cooperate in the investigation, including making the player available for an interview. The Commissioner may place a player accused of domestic violence, sexual assault or child abuse on paid Administrative Leave for up to seven days while the allegations are investigated before making a disciplinary decision. The agreement contains procedures for a player to immediately challenge that placement before the Arbitration Panel (below). The Commissioner shall have authority to discipline a player who commits an act of domestic violence, sexual assault or child abuse for just cause. There is no minimum or maximum penalty prescribed under the policy, but rather the Commissioner can issue the discipline he believes is appropriate in light of the severity of the conduct. The Commissioner’s authority to discipline is not dependent on whether the player is convicted or pleads guilty to a crime. A player may challenge his discipline before the parties’ Arbitration Panel, which consists of a representative of each party and the parties’ agreed-upon Impartial Arbitrator. A challenge to discipline will be governed by the “just cause” standard. The Panel may consider evidence of both aggravating and mitigating factors concerning the Player’s alleged actions when relevant and appropriate. The Commissioner may elect to discipline a player immediately after the conclusion of the player’s Administrative Leave, reinstate the Player and defer his disciplinary decision to until after resolution of any criminal charges, or under certain circumstances may suspend the player with pay until legal proceedings are completed (at which point the paid suspension may be converted to an unpaid suspension). All disciplinary suspensions under the policy that are upheld are without pay and suspended players will not accrue Major League service. A Club may not discipline a player for a violation of the Policy unless the Commissioner defers his disciplinary authority to the Club. Any such Club discipline may also be challenged through the arbitration process. Under the new policy, the parties have agreed that prior precedent and past practice of disciplining players for engaging in an act of domestic violence, sexual assault or child abuse may not be relied upon by a player to support a challenge to the severity of his discipline, but that all other disciplinary past practice and precedent will remain relevant. All players will be provided education in English and Spanish about domestic violence, sexual assault and child abuse at regular intervals. (All Major League players participated in education sessions during Spring Training of 2015, and Minor League players at all levels have received training organized by their respective Clubs throughout the season). A confidential 24-hour helpline (in English and Spanish) staffed by a team of experts in domestic violence has been established for players and their families, and we have identified highly-qualified resources in every Major League market who can provide on-the-ground support and resources to those affected by domestic violence. The parties shall regularly provide resources to players’ families, including referral information, websites, hotline numbers and outreach facilities. The parties will develop an annual program of community outreach which may include public service announcements featuring players, domestic violence awareness days at ballparks and other activities designed to spread awareness on the issues. Many Clubs already partner with anti-domestic violence organizations in this area, and many Players and their families already actively support domestic anti-domestic violence organizations in their communities.